When I compared broker web-based trading platforms a while ago, I mentioned that most brokers I am using only have web-based trading platforms, except Scottrade, which also offers a standalone, PC-based platform called ScottradeELITE (available for customers with account balance of $25,000 or more). What I like about the separate program is that it’s much, much more powerful than the web platform. Especially in terms of doing research, ScottradeELITE is more convenient. Now, another discount broker that I use joined Scottrade to offer a standalone trading program: The Xtend from OptionsXpress, the free trading tool. The first look at Xtend is pretty positive. The interface looks cool and I like how different sections of information are arranged and presented. At the top of the screen, there are benchmarks that give me a quick idea of how the broad market is doing, including the Dow, the Nasdaq, and the S&P 500. The main area is where you can customize to display what you want to monitor. The default setting shows my stock watch list, which is the same as the one I set up in my web account after logging into Xtend using the same login info. When I double click a symbol in the Watch List, it opens new window of details of stock. Right-click on any symbol in the Watch List brings up options to trade the stock, as well as going to OptionsXpress website for real-time streaming quote, which I find is quit weird. Isn’t Xtend the perfect place for streaming quotes? The central section has all the trade related information, for both stocks and options. Here, I have Trade Ticket, which is the place to enter an order, whether it’s a stock, options or future, all those trades offered by OptionsXpress. There’s also an Options Chain section for options trading which I am not very familiar. Finally, all the stocks I have in the Watch List also show in the Trade View. Here, trading can be made with only a few mouse clicks, which is quite convenient. On the right, I have account related information, such as Account Balance and Positions. 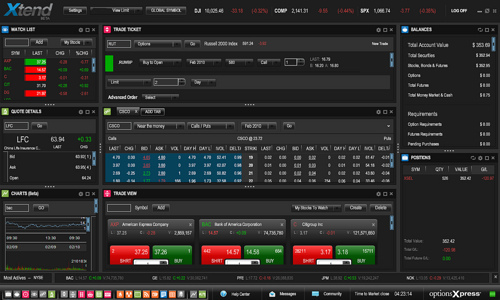 At the bottom of the screen, there are a lot of tools from OptionsXpress that can be added to the main window. For example, I added Charts into the left column to display the price change and volume of a stock for the past two days. Another feature of Xtend that I noticed is that when the program is running, it displays pop-up alerts when stocks’ gain or decline reach certain levels. The alerts I saw were set as default. I think they can be customized to only show what I am interested, but I haven’t found out how to do it. From the first look, I feel that Xtend looks better than ScottradeELITE, though I haven’t full explored all its functions yet, nor did I make any trade. There is no fee for OptionsXpress user to use Xtend. If you are interested in opening an account with OptionsXpress and trying Xtend out, you can take advantage of the OptionsXpress $100 bonus offer if you fund the account with at least $500 and make 3 trades in 12 months. Xtend is a well designed, robust desktop app. Adding and resizing windows or using the pre-built layouts is perfect. The stock and options trading windows are a bit underwhelming though. 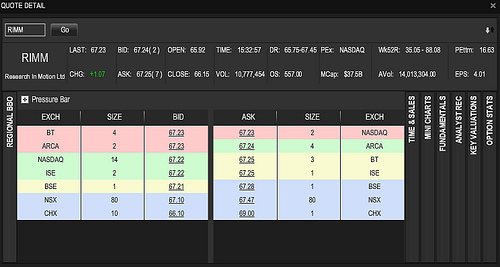 Not terrible but the trade ticket layout and interaction with watch lists and option chains could be better.